In a first, the U.S. government has without explanation classified data on the amount of territory in Afghanistan currently controlled by radical insurgents, a move that erases years of transparency on how American taxpayer funds are being used to help the Afghan government retain control of the country. The Special Inspector General for Afghanistan Reconstruction, or SIGAR, disclosed Monday that it would not include in its latest report facts and figures showing how much of Afghanistan is still under insurgent control. At last count, about half of the country was still controlled by Afghan militias and remained unsafe for U.S. officials. This data—which gives the American taxpayer and Congress a window into America's success in the 16-year-long war—will now be highly classified and only accessible to those with a security clearance and access to an official database. The Department of Defense also instructed SIGAR to classify all information on the Afghan National Defense and Security Forces, or ANDSF, including its force strength and capability. The effort to suppress this information appears to be part of a campaign to obfuscate just how much progress the United States has made in Afghanistan after nearly two decades and billions of dollars in taxpayer funds. John Sopko, SIGAR's chief official, criticized the Pentagon's decision, warning that hiding these figures will interfere with Congress's ability to perform oversight over the billions of dollars the United States continues to award the Afghan government, particularly in the defense arena. "This quarter, the Department of Defense (DOD) instructed SIGAR not to release to the public data on the number of districts, and the population living in them, controlled or influenced by the Afghan government or by the insurgents, or contested by both," Sopko said in the latest report. "SIGAR has been reporting district-control data since January 2016, and later added estimates of population and land-area control reported by DOD," he said. In a mysterious move, the Pentagon decided that while these numbers will remain "unclassified" in an official capacity, the new ruling prevents the public and those without security clearance from accessing the information. "This development is troubling for a number of reasons, not least of which is that this is the first time SIGAR has been specifically instructed not to release information marked ‘unclassified' to the American taxpayer," Sopko said. "Aside from that, the number of districts controlled or influenced by the Afghan government had been one of the last remaining publicly available indicators for members of Congress—many of whose staff do not have access to the classified annexes to SIGAR reports—and for the American public of how the 16-year-long U.S. effort to secure Afghanistan is faring," he noted. It is particularly troubling given that the amount of territory controlled by the Afghan government has been falling since SIGAR began tracking the situation. This fact "should cause even more concern about its disappearance from public disclosure and discussion," according to Sopko. 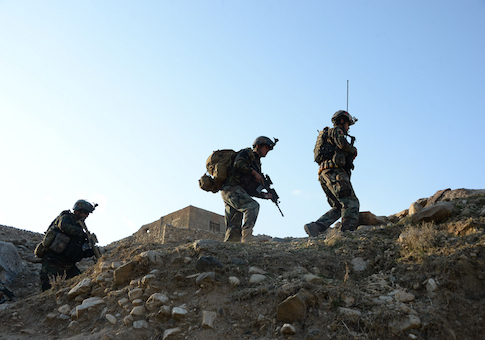 More concerning, according to Sopko, the "DOD this quarter, for the first time since 2009, also classified the exact strength figures for most Afghan National Defense and Security Forces (ANDSF), another vital measure of ANDSF reconstruction," according to Sopko. Performance metrics for the Afghan fighting force also were classified for the second consecutive time. While many in Congress have not raised an issue with the new classification restrictions or indicated they are aware of it, Sen. Chuck Grassley (R., Iowa) expressed concern late last year, when he was first informed of the new edicts. "If sensitive information that should've been classified was publicly available for extended amounts of time before eventually being classified, that raises serious questions about the Department of Defense's classification process," Grassley, chair of the Senate Judiciary Committee, said in a statement at the time. "According to SIGAR, the now-classified data doesn't disclose information that could threaten U.S. or Afghan missions," he said. "It appears more likely that classification is being misused again, potentially to shield the department from scrutiny." "Abusing classification as a tool to extinguish sunlight undermines public confidence that U.S. taxpayer dollars are being well-spent on America's longest war," he said. "If security classification is being abused to hide waste and mismanagement or failed policies, those responsible should be held accountable. There can't be accountability without transparency. These sudden classifications need to be explained, and if they're improper, they should be reversed." Editor's note: This story was accidentally published ahead of the embargo date/time; we regret, and apologize for, the error.